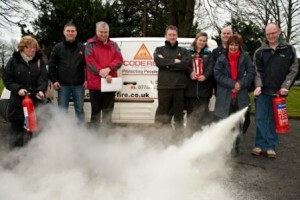 You are here: Home » Blog » Fire Training / Warden Courses » Charity fire warden course new year offers. Charity fire warden course new year offers. 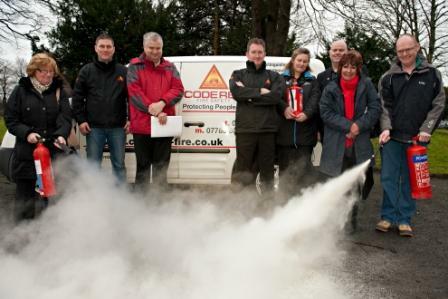 Yesterday (22/12/11) we were privileged to offer a completely free fire warden course to local charities in the area at the Normandy Hotel in Renfrew. We know how challenging fire protection can be and staying fire safe especially at Christmas time and that why we decided to give an early christmas present away. It made us think what more could we do to protect our charities and keep them strong! We are Real Fire Fighters from that professional background and know what real training is needed so with that in mind we thought of how we can keep you fire safe and safeguard your hard efforts for people in need. With that in mind we are offering fire warden course places at a discounted rate of £6o plus VAT as opposed to the normal rate of £90 plus VAT to any charity. OR if you change your fire extinguisher contract to ourselves then you will be entitled to another free course place. Even if you just fancy a no obligation chat to see how we can help then give us a call where we will be more than happy to help. These offers stand for 12 months and please remind us of that when you call. Please call to discuss full courses with us and the prices for them. Have a brilliant Christmas everyone and a fantastic new year when it comes. This entry was posted in Fire Training / Warden Courses, Special Offers and tagged charity, Fire, glasgow, marshal, offer, scotland, special, training, warden. Bookmark the permalink.